Published on 1 April 2019 (but written exactly a year earlier). I’m writing this in the courtyard of Television Centre in West London, which I happened to be passing today. I’m gazing up at the newly restored statue of Helios and watching the repaired fountains dance as they never have on any previous visit. I think for most British people of my age, Television Centre is the home of Going Live, Live & Kicking, Blue Peter, Ed the Duck, Otis the Aardvark, and Philip Schofield and Andi Peters’s broom cupboard. 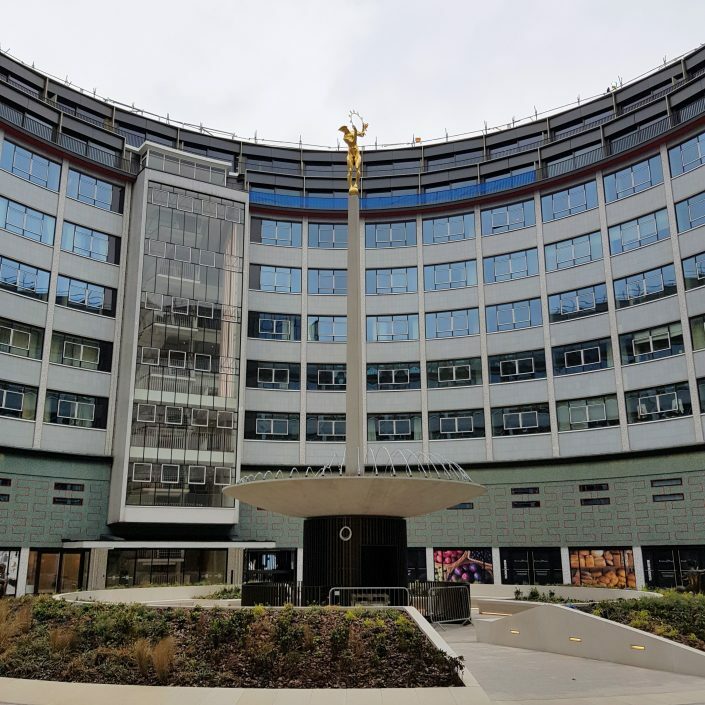 After the BBC moved off the site in 2013, it has been closed for restoration and redevelopment, with luxury apartments the order of the day—albeit with three television studios remaining. It seems ironic that two-thirds of the studios in a location so closely associated with the BBC are to become the new standing home of iconic ITV programmes like This Morning any day now. 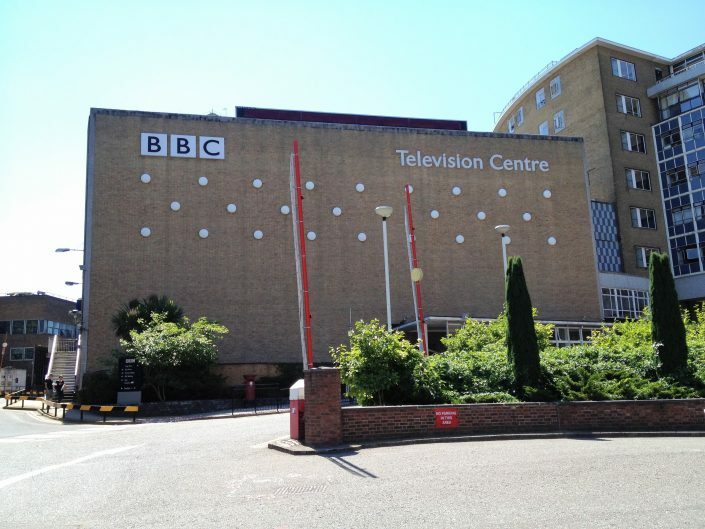 I last visited Television Centre with Wendy, a few months before it closed. 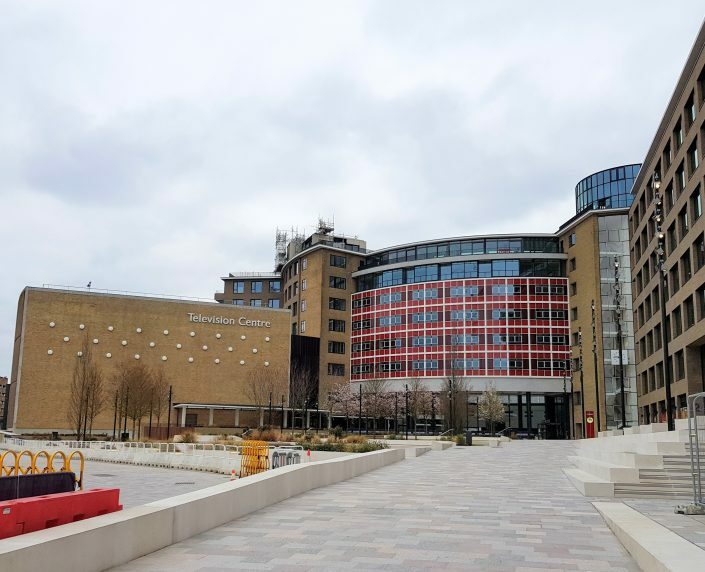 We were lucky enough to secure a place on one of the final tours of the building and were fascinated to get an understanding of the mechanics of production of TV shows (and especially news programmes). This aspect was far more interesting to both of us than the celebrity anecdotes, tour of the Match of the Day set, or inevitable visit to the gift shop. We both felt a little uncomfortable at the tour of the ‘celebrity’ dressing rooms, knowing that they were the settings for sexual abuse: our visit coincided with a 12-month period in which horrific historical examples of abuse at the BBC were being recalled almost daily on the front pages of newspapers. The fabric of the building was also falling apart at the seams, the sense of magic ebbing away with the physical as much as the moral dilapidation. Towards the end of the tour, we were press-ganged into making up the numbers for the studio audience of a recording of a truly terrible daytime game show which we’ve seen neither hide nor hair of since. In a high-pressured time-limited trivia finale, the host fluffed the reading of almost every question. He then got to record ‘pick-ups’, having a second (and occasionally third) go at reading them correctly. The contestant didn’t get a second go at answering them, and so presumably ended up appearing inexplicably flummoxed by perfectly simple questions, through no fault of her own. “TV magic”, it seems, still favours the “talent”. This afternoon, Television Centre is quiet. In fact, as I tap away, I’m the only person in the courtyard. At least from the outside, the restoration appears sympathetic. The front of the site looks all the better for the landscaping that has replaced the exterior car park, which also has the effect of making the Centre seem smaller and more intimate. I expected to feel a certain sense of melancholy from coming to a place to which I once felt such a close connection, knowing that a part of our collective cultural heritage had been auctioned off to the highest bidder and converted into apartments I could never hope to afford. And yet, that is not how I feel. Perhaps incongruously, I feel a strange sense of satisfaction at seeing the building sympathetically restored. The impression is of quality and accessible historical grandeur, and it feels strangely as though the hope for the future inherent in redevelopment has frightened away the collected ghosts of the past. It doesn’t feel like a wonderous “TV factory” any more, as it did from a distance in my childhood; but nor does it feel like a tainted crime scene, as it did on my last visit. It feels like a housing development sympathetically built around a listed building—which is, I suppose, exactly what it is. 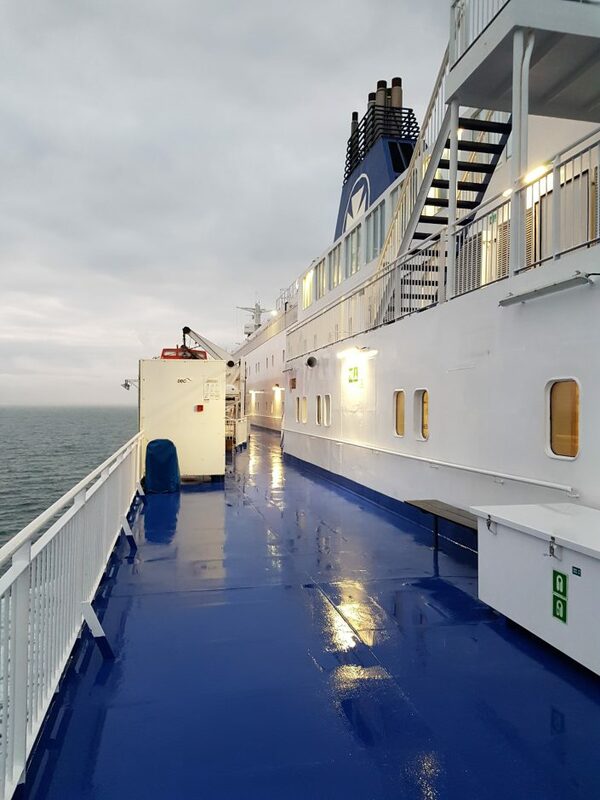 This 2,423rd post was filed under: Posts delayed by 12 months, Travel, Architecture, BBC, London, Media, Travel. Published on 5 June 2012. I’m cheating slightly today since this is a photo from yesterday, but I thought it was quite pretty. 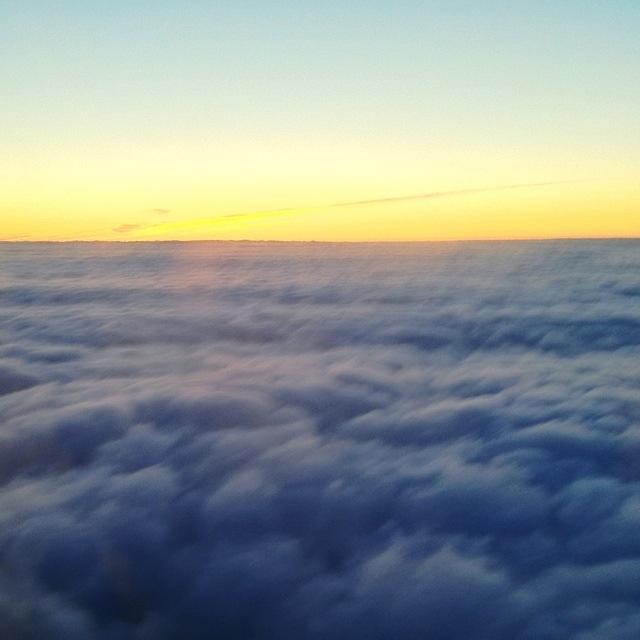 As Wendy and I flew from Belfast to Newcastle, the sun was setting and the sky looked lovely! Unfortunately, my photo’s a bit blurry, but the colours look nice. 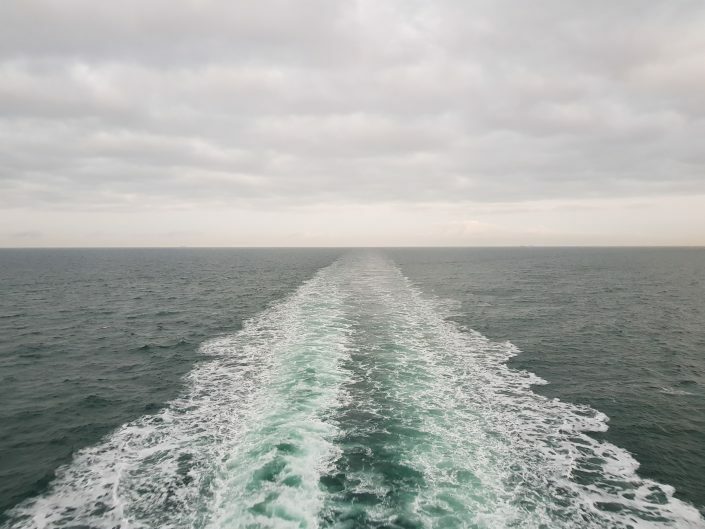 This 1,675th post was filed under: Photo-a-day 2012, Aviation, Public Transport, Travel.